Operating in the shadows of the Trump administration’s chaos and the financial scandals dogging Interior Secretary Ryan Zinke, a powerful trio of Interior Department political appointees is now in place to accelerate an already aggressive effort to quickly offer leases for millions of acres of public land—much of which is in sensitive environmental areas—to the oil and gas industry. A combination of appointments by President Donald J. Trump and Secretary Zinke have installed senior leadership at the Department of the Interior who have extensive experience in running government bureaucracies while embracing an anti-environmentalist agenda that furthers development of fossil fuels. Overseeing the department’s daily operations is Deputy Interior Secretary David Bernhardt, a former oil, gas and mining lobbyist who also served as a high-ranking official in President George W. Bush’s Interior Department, where he strongly supported fossil-fuel extraction from public lands and used reports funded by oil companies in congressional testimony. Since Bernhardt was confirmed by the Senate in July 2017 — after overcoming concerns about his cozy relationship with the oil and gas industry and numerous potential conflicts of interest — he has focused on implementing a series of executive orders issued by Trump and Zinke regarding regulations that “burden” the energy industry. The primary goal is to increase energy production from more than 245 million surface acres controlled by the department’s Bureau of Land Management and 700 million acres of subsurface mineral rights. To facilitate this effort, Bernhardt signed an August 2017 order “streamlining” Environmental Impact Statements, documents required under the National Environmental Policy Act that frequently take years to complete and can easily surpass thousands of pages. Bernhardt directed Interior agencies to limit impact statements to not be more than “150 pages or 300 pages for unusually complex projects.” The order also required Interior agencies to complete the statements “within 1 year from the issuance” of a “Notice of Intent” to prepare the statement. Prior to his appointment, Bernhardt was a lobbyist for the Rosemont Copper Co., which is seeking permits to build the nation’s third-largest open-pit copper mine in southern Arizona. The Environmental Impact Statement for the project took the U.S. Forest Service more than eight years to complete and is many thousands of pages. Accompanying Bernhardt is Greg Sheehan, whom Zinke appointed in June 2017 to the newly created position of principle deputy director of the U.S. Fish and Wildlife Service. There, he is responsible for protecting endangered species and enforcing hunting and fishing regulations, despite the fact that in July 2017 testimony before Congress, Sheehan expressed support for proposals in Congress to weaken the Endangered Species Act. Sheehan’s opposition to endangered species has a long history. Prior to his appointment he served as the director of Utah’s Division of Wildlife Resources, where he opposed allowing the endangered Mexican gray wolf (Canis lupus baileyi) into the state and eased restrictions on killing and relocating the endangered Utah prairie dog (Cynomys parvidens). More recently Sheehan, an avid hunter, attracted headlines last November when he lifted a ban on the importation of elephant trophies from two African countries while attending a hunting conference in Tanzania. Earlier this month, the Fish and Wildlife Service, under Sheehan’s direction, proposed a rule that would remove key protections in the future for species classified as “threatened” under the Endangered Species Act, which is one classification below “endangered.” Currently, threatened species receive the same protections as endangered species to prevent their harm, death or harassment from human activities. Completing the trifecta, former Texas Comptroller Susan Combs was appointed by Zinke last month to serve as acting assistant secretary for fish, wildlife and parks. A fierce opponent of the Endangered Species Act, Combs’ position at Interior oversees the Fish and Wildlife Service and the National Park Service. A previous attempt by Trump to appoint Combs as Interior’s assistant secretary for policy, management and budget was blocked in the Senate after Sen. Bill Nelson, D-Fla., put a hold on her nomination until he received assurances that the administration would not pursue offshore drilling off the Florida coast. Combs is adept at working the legislation and bureaucratic labyrinth to weaken protections for endangered species. In 2011, she helped maneuver an 11th-hour bill, backed by the oil and gas industry, through the Texas Legislature to shift oversight of endangered species from the state’s Parks and Wildlife Department to the Comptroller’s Office, which she headed. Combs, a rancher and former Texas agriculture commissioner, is now in a powerful position to weaken protections for threatened and endangered species to facilitate expansion of oil and gas development into areas that are critical to their survival. The Bernhardt-Combs-Sheehan troika is poised to implement internal department policies through instruction memorandums to streamline oil and gas leasing and staff reassignments to undermine environmental protections on public lands and for endangered species that will help accelerate oil and gas leasing. “These are the people behind the curtain who are really, really changing our public lands and setting a future direction that may or may not be consistent with what the law requires,” says Jim Lyons, a research scholar at the Yale School of Forestry and Environmental Studies. Bernhardt, as solicitor during the Bush administration, wrote a legal opinion that Interior could not use the Endangered Species Act to address the threats of climate change on polar bears, even if the species was listed under the act, according to a letter opposing his Senate confirmation signed by 150 environmental organizations. Not surprisingly, a primary goal of Trump’s Interior Department is to fundamentally undermine protection of endangered species. “I anticipate these officials will support legislative efforts to weaken the Endangered Species Act, as well as pursue regulatory and policy-based efforts internally to also decrease both procedural and substantive protections for threatened and endangered species,” says Daniel Rohlf, a law professor at Lewis & Clark Law School in Portland, Ore., specializing in the protection of endangered species and their habitat. “They fundamentally do not believe in the Endangered Species Act or in other statutes that protect the environment,” Owen says. Greg Sheehan, Susan Combs and David Bernhardt are implementing Trump’s energy-dominance agenda while ignoring Congress and the public. Zinke’s appointments of Sheehan and Combs to high-ranking Interior Department positions have not been sent to the Senate for confirmation, as required by the Constitution and subsequent legislation. This continues a pattern by the Trump administration of avoiding Congressional oversite. Acting directors, rather than presidentially appointed directors requiring Senate confirmation, also oversee the National Park Service and the Bureau of Land Management. Avoiding Congressional oversight through the Senate confirmation process is unprecedented, critics say, and raises serious questions of whether decisions made by “acting” officials such as Sheehan and Combs will withstand legal challenges. The U.S. Government Accountability Office is reviewing a complaint filed in February by Public Employees for Environmental Responsibility alleging that the acting Interior appointments violate the Federal Vacancies Reform Act. The complicated law outlines how long temporary, or acting, officials can remain in office. For vacancies that occur on the day of, or within 60 days of, a new president’s inauguration, an acting officer may serve for 300 days from the date of the vacancy, according to Lawfare, a legal blog. “Why don’t the missions and responsibilities of the Park Service, [Bureau of Land Management] and Fish & Wildlife Service merit permanent, Senate-confirmed directors?” asked Jeff Ruch, executive director of the Public Employees for Environmental Responsibility, in a recent news release. The answer appears to be that the Trump administration wants to avoid public scrutiny of Interior’s decisions and sidestep Congressional oversight. This is occurring while the department systematically dismantles policies designed to protect the multiple use of public lands, including conservation and recreation, and tilt public lands use solidly in favor of the oil and gas industry. By creating a “shadow” agency, McEnaney says, the Trump administration reduces transparency of critical actions taken by Interior leadership, which is now dominated by oil and gas industry supporters and hostile to protecting biodiversity and combating climate change. For example, last week the Interior Department issued new legal guidelines that undermine the enforcement provisions of the 1918 Migratory Bird Treaty Act, which was one of the first major conservation laws adopted in the United States. The department, according to a December 2017 solicitor’s opinion that was forwarded to Bernhardt, will no longer pursue penalties against individuals or companies whose actions resulted in killing or injuring migratory birds if the intent of the action was not to harm or kill birds. Oil companies will be the greatest beneficiary of the law, according to an Audubon Society study. Under Interior’s new enforcement guidelines, oil companies responsible for the 2010 Deepwater Horizon spill in the Gulf of Mexico and the 1989 Exxon Valdez oil spill in Alaska would not have been fined for injuring or killing migratory birds. Seventeen former Interior officials — including the Fish and Wildlife directors under presidents Richard Nixon, George H. W. Bush, Bill Clinton, George W. Bush and Barack Obama — repudiated the reinterpretation in a Jan. 10 letter to Zinke after the legal opinion underpinning these new guidelines was first announced. Unlike many environmental laws, the Migratory Bird Treaty Act does not have a provision allowing citizens to file a lawsuit seeking to overturn the department’s new interpretation. Kate Kelly, a former senior advisor to President Obama’s Interior Secretary Sally Jewel and now director of public lands for the Center for American Progress, also says Interior is shutting out Congress. The public is being ignored as well, she says. Kelly points to Zinke’s decision to reduce the size of several national monuments last year, including Bear Ears and Grand Staircase-Escalante in Southern Utah, despite receiving more than 3 million comments from the American public in support of maintaining the monuments as they are. “Despite that overwhelming response, [Zinke] decided to take the unprecedented actions to rollback protections for national monuments,” she says. Under Bernhardt’s direction, the Interior Department’s quarterly sale of 10-year oil and gas leases across the West eliminates environmental conservation not only for the leased acreage, but also a wide portion of the surrounding public lands. Combs and Sheehan, through their direct oversight of implementing the Endangered Species Act, are expected to play a key role in reducing protections for species that could slow oil and gas development. 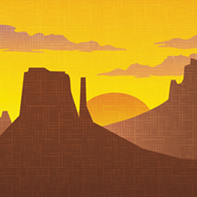 Last month, the Interior Department sold 43 oil and gas leases in Southern Utah covering 51,000 acres for about $1.5 million, which averages only $29 per acre. Many of the plots are believed to have scant oil resources, but the lease sales effectively sterilize the land for conservation purposes for the next decade, if not much longer. “Once you start leasing areas that have never been leased before, you foreclose opportunities for conservation in those areas,” McEnaney says. Most of the time, the leased federal land never is developed for oil and gas production. There are about 27 million acres of public land leased to oil and gas companies. But only 46 percent of that is in production, according to a report by WildEarth Guardians. The discrepancy between leases and production is particularly wide in Nevada where 1.1 million acres have been leased to oil and gas companies but only 27,000 acres, or 2 percent of all leased acreage, is in production. Despite the huge surplus of oil and gas leases that are not producing, the Interior Department is continuing to offer massive amounts of public land for lease. The oil and gas industry, so far, has given the department the cold shoulder. Last year, McEnaney says, the department offered 11.85 million acres for 10-year leases, but only 782,000 acres were purchased. Despite the low conversion rate of leases offered to leases sold of about 6 percent, the leased land will likely remain in control of the oil and gas industry well past the 10-year lease term. 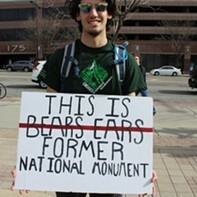 Bears Ears rally at the Capitol on May 6, 2017. 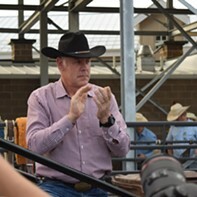 The Interior Department’s unorthodox operation of relying on acting officials such as Sheehan and Combs under the direction Bernhardt is on a collision course with Congress over several provisions included in the omnibus spending bill enacted last month. “One big concern is we will be seeing if Secretary Zinke and the Interior Department follow the budget that congressional appropriators just passed,” says Aaron Weiss, media director for the Center for Western Priorities. Congress explicitly opposed three Interior initiatives. First, Section 120 of the omnibus bill, signed into law last month by President Trump, expressly prohibits the department from spending funds on its proposal to revise an agreement between federal agencies, states, private landowners, industry and conservation groups to conserve 35 million acres of federal lands across 10 states to protect the imperiled greater sage grouse (Centrocercus urophasianus). The unprecedented agreement was reached to keep the bird off the endangered species list to avoid major economic losses across its habitat. Last September, the Interior Department announced its intent to amend the greater sage grouse land-use plans to loosen protections for the bird to encourage energy and mineral production from lands within its habitat. Congress has now ordered the department to leave the 2015 plan alone. “Congress sent down very explicit instructions on sage grouse, where they said stay the course, honor the deal,” Weiss says. Bernhardt, Combs and Sheehan will play a central role in whether and how the administration plans to advance its sage grouse reforms because of Endangered Species Act implications. Congress also rejected Interior’s request to eliminate funding for the Land and Water Conservation Fund. The fund is financed by oil and gas leases on the Outer Continental Shelf. Instead, Congress appropriated $425 million for the fund, up $25 million from 2017. The fund supports the protection of federal public lands and waters and provides matching grants to the states and tribal governments for the purchase and development of public parks and outdoor recreation sites. Since it was created in 1965, the fund has provided $3.9 billion in grants to states for more than 40,000 projects. Finally, Congress turned down Interior’s request for $18 million to begin a department-wide reorganization, which would have transferred personnel from Washington, D.C., to locations primarily in the West. Bernhardt has been working with Zinke to advance the reorganization plan. The bill “included language that explicitly reminded the administration they need to seek approval from Congress and they don’t have approval yet,” says Kate Kelly of the Center for American Progress. The spending act has set clear limitations on what Interior’s leadership can pursue while providing the agency more money than it requested for conservation efforts. So far the Republican-controlled Congress has not held the Trump administration accountable for its refusal to fill agency director positions at the Interior Department with officials that require Senate confirmation such as Susan Combs and Greg Sheehan. Asked if there is anything that can be done to force the Trump administration to make appointments that require Senate confirmation, Aftergood could only guess. A version of this article appeared in The Revelator. Can Utah bounce back from its latest public lands debacle?